I have a confession to make. My favorite feature of the Treo is not the beautiful screen, or the keyboard. It is not having my email and web at my fingertips, nor the integration of Palm OS. 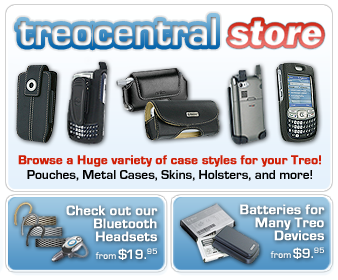 No, my favorite feature is the humble ringer switch at top of every Treo. An ode to the ringer switch. to control whether the Treo can beep or not. from ring to vibrate or vibrate to ring. you rest assured that you will not be a ringing fool. of watching others in the room fumble with lesser phones. a most useful innovation unceremoniously placed into life. Tech writers should never write poetry, but I did promise an ode in the title of the essay. It is surprising; no other phone has ever used the simplicity of a ringer switch. Every phone has a method to turn off sound, but all except for the Treo's ringer switch are flawed. In every case, these methods require the user a) push multiple buttons to get the task done, and b) look at the screen to confirm that the sound is off. The Treo's ringer switch solves both of these issues, providing one button control, and physical feedback (run your finger over the top of the Treo) over the status of the device. I was curious to how the idea of a ringer switch cameup, so I asked PalmOne, and Chris Cadwell, Director of Product Marketing, responded. As the story goes, Donna Dubinsky, the co-founder of Palm and Handspring, "hated having someone's PDA or cellphone ring or sound an alert during a meeting. It distracted her, and drove her up the wall." Donna's immediate solution to the problem was to enact a $1 fine whenever a phone or PDA went off. It was under these condtions that Handspring engineers designed the Visorphone. During one design meeting, "Jeff Hawkins, [inventor of the Palm Pilot, Palm and Handspring co-founder], said he wanted a way to turn off the ringer and other sounds quickly, and a slider switch just seemed like the obvious idea. I do not remember who came up with the slider idea initially, it may have been Jeff himself, but honestly the team didn't realize that we were doing anything unique or different at the time - such was our inexperience with cell phones back then! It was just obvious to us that this was needed, so we did it. What really surprised us, I think, was realizing later that other cell phones didn't have this feature, and moreover, I continue to be surprised, given how useful that little switch is, that no company I know of has copied it!" Cadwell ended, "So as far as I know we've never considered getting rid of it. Most of us use it often (even now that Donna isn't here anymore) and we do get lots of positive feedback from our customers about this feature." Long live the ringer switch!